The back cover of Every Day, Every Hour, Nataša Dragnić‘s first novel, describes the book as, ‘An irresistible romance which heralds the summer; the perfect holiday read.’ Not for me, it isn’t. My perfect holiday reads are long, challenging books, preferably with a foreign setting, which need the extra reading time and space a good holiday provides. 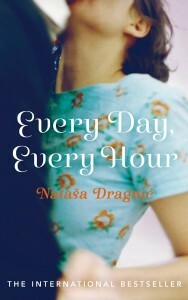 The only challenging element in Nataša Dragnić’s novel is the chronological jumps from one place and period to another. The book tells the story of Dora and Luka who live with their families in the Croatian seaside town of Makarska. They meet on Dora’s first day at nursery school. Dora is two years old and Luka is five. Luka faints and he is revived by two-year-old Dora murmuring, ‘You are my sleeping beauty, only mine, wake up, my prince, you are my prince, only mine.’ Surprisingly Luka recovers and a beautiful friendship is born which lasts throughout the novel despite the numerous difficulties which threaten to derail it. Despite the age difference, Luka and Dora are inseparable until, in 1968, four years after their initial meeting, Dora and her family leave Makarska to settle in Paris where Dora’s architect father has a new job. In Paris Dora masters the French language and years later becomes an acclaimed actor. Meanwhile in Makarska, Dora’s success as an actor is mirrored by Luka’s success as painter. Sixteen years later, in a Paris art gallery showing Luka’s work, they meet again. Just as he did twenty years earlier, Luka faints and is revived by Dora murmuring, ‘You are my sleeping beauty…’ etc. Despite both Dora and Luka having other romantic entanglements they immediately become lovers. After a few months Luka returns alone to Makarska only to find that his former lover, Klara, is pregnant. And so on, for the next hundred and fifty pages, forwards and backwards between Paris and Makarska, Dora and Luka, despite marriages to other people and both wanted and unwanted pregnancies, struggle to establish the lasting relationship their souls cry out for. The Yugoslav wars of the 90s hardly feature. Early on in the book Dora’s mother, to her husband’s consternation, demonstrates her Croatian nationalism by insisting on referring to the Croatian town of Zagreb, rather than Belgrade, as the capital. But this is never followed up. Later in the book Luka joins the Croatian army but the political significance of this is ignored. During the siege of Dubrovnik he is wounded in the leg. He recovers and the only legacy of the war is his limp. Every Day, Every Hour is a love story which largely ignores the political and military situation of the period in which it is set. By doing so it fails to live up to its blurb description as ‘the perfect holiday read’.